A is for Alberto. It’s only May 20, 2012 and hurricane season doesn’t start until June 1, 2012. Alberto is not a hurricane, it’s just a tropical storm. Alberto is hovering off the coast of South Carolina and losing strength. Hurricane Season 2012: Columbus, Ohio is not Hurricane Country we are too far inland… except for Hurricane Ike in 2008. 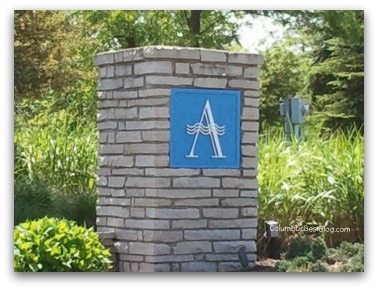 The “A” above is really for Village at Alum Creek, a Lewis Center, Ohio neighborhood. <—- a link to my Real Living HER website, a page about Lewis Center neighborhoods. Columbus weather is available on that site. Or Columbus Climate. Or Lewis Center Climate…. and the climate in Dublin, Powell, Westerville, Worthington, etc. Pretty similar, wouldn’t you think? Relocating to Columbus: What’s the weather like? Where do you find information on Lewis Center climate or Columbus climate (Dublin, Powell, etc. etc. etc.) on my real estate website? Local Information then Environment and then put in a community, or zip code or address. MaureenMcCabe.com is a short cut to my real estate site. Click the “Local Information” link. Search by address, community, zip code for Local Information. Lewis Center gets a smidgen more rain…. 1.4 inches more than the national average and 6 inches less snow than the national average. Relocating to Columbus? Compare to your area to know what to expect. There’s information about the local housing, people, schools and quality of life on my real estate site too. Weather in Columbus is wonderful. It’s a lot warmer than Northern Ohio. I’ve lived in north-east Ohio, south-west Ohio and central Ohio (grew up in Wisconsin.) Big difference in weather from ne Ohio to sw Ohio I like central Ohio, winters are not as crazy as NE Ohio or Wisconsin, Michigan. Next post: Ohioan’s Polled said Columbus is Best!